The general membership meeting of the Journalism Education Association was held Friday, April 13, 2018, in Foothill C, Second Level at the Marriott Marquis hotel in San Francisco. It began at 8 a.m. and was presided over by Sarah Nichols with Connie Fulkerson as secretary. Board members: Sarah Nichols, president; Val Kibler, vice president; Lori Keekley, scholastic press rights director, Megan Fromm, educational initiatives director; Tom Gayda, director at large; Michael Malcom-Bjorklund, director at large; Julia Satterthwaite, director at large. Committee chairs/editors/liaisons: Kim Green, Patrick Johnson, Karen Slusher, Nina Quintana (also a state director); Adam Dawkins, Evelyn Lauer, Jon Rogers, Aaron Manfull, Erin Coggins. Staff: Kelly Glasscock, executive director; Connie Fulkerson, administrative assistant. State directors: Heather Nagel, Maggie Cogar, Doreen Picozzi, Matt LaPorte, Nancy Hastings, Jeremy Murphy, Danielle Ryan, Brenda Field, Christine Brandell Melendez, Larry Steinmetz, R.J. Morgan, Erinn Harris, Linda Ballew, Sandra Coyer, Marva Hutchinson, Erin Castellano, C.E. Sikkenga, Albert Dupont, Michelle Harmon. Members: Linda Barrington, Rachel McCarver, Nicole Laughrey, Margie Raper, Jim Streisel, Roth Lovins, Peggy Gregory, Kathy Schrier, Pedro Cabrera, Lisa Cardarelli, Candace Bowen, John Bowen, Karl Grubaugh, Barbara Bateman, Mary Anne McCloud. Adam Dawkins, CJE, by Evelyn Lauer, MJE, for increasing engagement through creative, relevant connections during Scholastic Journalism Week. Dr. Jean Folkerts by Sarah Nichols, MJE, for actively supporting JEA and strengthening the organization’s relationships with the A.Q. Miller School of Journalism and Mass Communications. Melissa Falkowski and Sarah Lerner by Saran Nichols, MJE, for acting with courage and grace to showcase the importance of student voices, using the spotlight as a powerful platform to validate the skills developed in scholastic journalism programs. Carmen Wendt, MJE, by Sarah Nichols, MJE, for exemplary leadership and service as Arizona’s state director by building positive relationships, connecting members and nurturing new journalism teachers. The board passed the FY 2018-19 budget. Several line items were adjusted to add to development of the Write-off contest system. Highlights of the new budget: A New Voices workshop, certification exams for CTE at convention, New York Times digital subscriptions for members, an expanded JEA/NSPA Partner Project, Participate for virtual training, budget for instructional videotaping, and increased money for state directors coming to two conventions. Progress toward board goals and a new membership initiative was discussed in the board Power Hour. Kelly Glasscock reported that San Francisco registration before walk-ins was 4,451. This was higher than the 4,100 initially projected. Pacemaker and Journalist of the Year finalists and Impact Award winners were recognized at the Thursday opening. The JEA and NSPA awards ceremonies were combined into one Saturday ceremony. This will prompt the convention planners to block to more hotel rooms for Wednesday and Thursday nights in the future. Extended sessions requiring preregistration filled quickly. This has been an excellent model to expand on for Anaheim next year. Brenda Field, chair of the Chicago local committee, said things are progressing for the fall convention and invited people to attend Nov. 1-4. Don Bott, San Francisco local committee chair, welcomed everyone to the convention. Kelly Glasscock reported that the net revenue on JEA’s profit and loss statement was -$32,970.47 as of March 7, 2018. This did not include the income from the San Francisco convention. 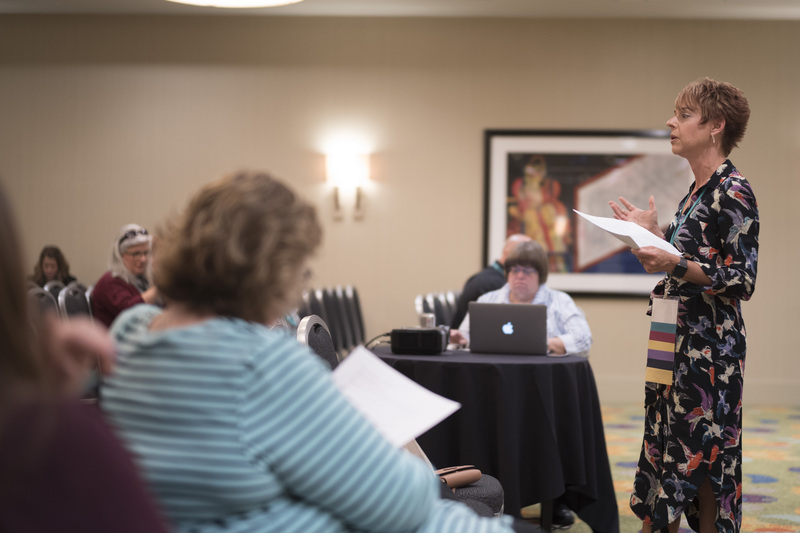 Lori Keekley – There will be a New Voices Workshop at Advisers Institute for people wanting strategies for getting free expression legislation passed in their states. Scheduled for the Monday afternoon before the conference kickoff that night, it will be free for those registered for the Advisers Institute. Megan Fromm – Curriculum has been added to the website. Aaron Manfull – At the Digital Media committee meeting a new web host plan will be discussed. A call has been put out for members to submit newsroom photos so people can see what newsrooms look like across country, including adviser and students’ favorite things in those rooms. Patrick Johnson – The last issue of Mentoring Matters was distributed. Evelyn Lauer – Reminded members of the One Book “Work Happy” leadership session open for advisers and students. Karen Slusher – Reminded members of the upcoming July 15 awards deadline for Broadcast Adviser of the Year, Administrator of the Year, Carl Towley Award, Rising Star, Future Teacher Scholarships, Medal of Merit and Friend of Scholastic Journalism. Jonathan Rogers – JEA’s aligned curriculum is a good selling point for NCTE. Flipboard magazine shows what high school journalism is all about. Kim Green – Certification testing will be held at various sites throughout the summer. Nina Quintana – CTE testing with Adobe Certiport and Precision exams will be given in Chicago for students and advisers. There was no new business introduced by members. Lori Keekley moved and Erin Coggins seconded to adjourn the meeting. Sarah Nichols adjourned the meeting at 8:46 a.m. The next meeting of the general membership of the Journalism Education Association will be 8 a.m. Nov. 2, 2018, at the Hyatt Regency in Chicago.